Small and portable Freeview DVB-T digital TV receiver. Includes built-in 110mm telescopic antenna, so you don’t have to carry a TV antenna when you travel! Record Freeview TV to disk in original quality format. TimeShift TV: stop, pause and rewind TV. Built-in external antenna connector too, so you can connect to a roof antenna when inside your home or office building. DVB-T Digital TV stick with built-in telescopic antenna. Watch Digital TV with Recording and TimeShifting. 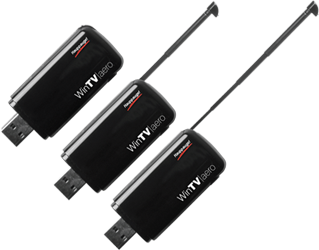 WinTV-Aero is the most portable Freeview DVB-T receiver for your laptop or netbook! With the built-in telescopic antenna, your antenna is always available, making WinTV-Aero the most portable digital TV receiver on the market today! Enhanced DVB-T reception. Inside the WinTV-Aero is the latest, highly sensitive, DVB-T receiver for the best TV reception possible. WinTV-Aero is simple to connect to your notebook or netbook. Just plug it into a USB 2.0 port, extend the built-in telescopic antenna, install the WinTV application and you're ready to watch and record high quality digital TV on your computer screen. WinTV-Aero also runs on laptop computers with Windows Media Center. Digital TV recorder, too! Record digital TV programs to disk and play them back on your PC screen in the original digital quality. Use the integrated digital TV guide (EPG) and recording scheduler to ensure you don't miss your favorite programs. With a single click of your mouse schedule recordings for the next 7 days via the built-in EPG. Use the remote control included to effortlessly enjoy all the benefits of a high end Digital Video Recorder set top box on your PC! Includes the new Hauppauge WinTV v7 application. WinTV v7 makes watching, recording and pausing live TV a breeze. The simple and more dynamic button layout means all the essential functions are never more than one click away. With WinTV v7, you record using the original high quality Freeview digital TV format. The WinTV-Aero supports DVB-T radio. DVB-T radio is not DAB or DMB radio. The WinTV-Aero supports DVB-T TV not DVB-T2. Microsoft® Windows 8®, 7®, Windows Vista with latest Service Pack or Windows XP Service Pack 3. PC with 1.0 GHz processor or faster or netbooks with Intel Atom processors. One free USB 2.0 port. WinTV-Aero with highly sensitive built-in DVB-T tuner and antenna, plus connector for an external antenna. IEC to MCX adapter cable for use with external antenna.